Got Road Salt? Cities Across The Country Are Running Out Of It This winter's relentless snowstorms have depleted stockpiles of rock salt and pushed the industry to its limit. Even areas with vast quantities of salt underground are scrambling to get enough to melt the ice on their roads. Traffic on Staten Island during a winter storm earlier this month. New York is among the states affected by a shortage of rock salt. You know you have a widespread problem when Milwaukee fights road ice with cheese brine, New Jersey breaks out the pickle juice, and New York, a major salt producer, declares a shortage. The waves of snowstorms in much of the country have exhausted supplies of rock salt, the main tool that road crews use to melt ice and snow. Even areas with vast quantities of salt underground are having a hard time getting it onto their streets this year. Hutchinson, Kan., calls itself "Salt City," and it's just down the road from Wichita. But days after a big storm hit recently, Wichita's busy streets were still snow-packed and icy slick. Lindsey Durham, a Wichita middle school teacher, stood in the snow next to her dented car, describing one of many fender benders there. "It kind of sounded like I was in a sardine can for a moment," she said of the accident. 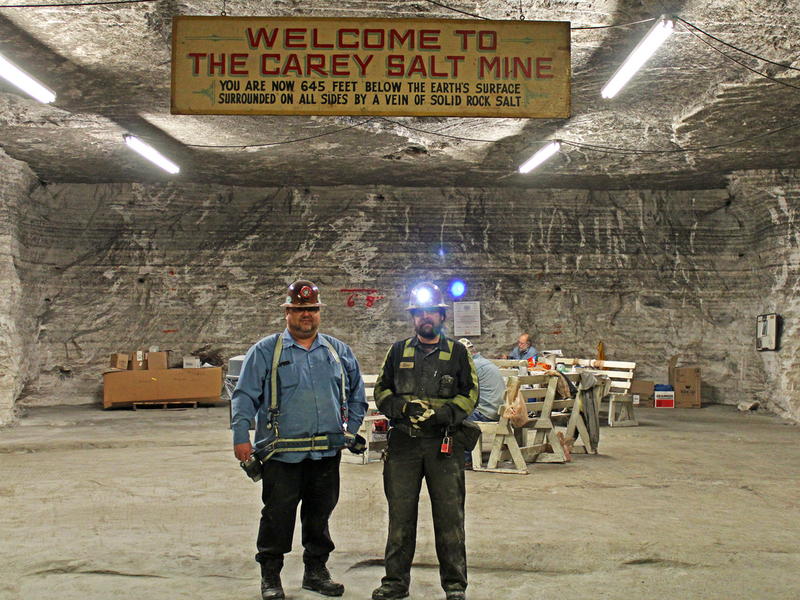 At Hutchinson Salt Co., John Kinkaid and Eric Price stand under the sign bearing the old name of the mine. "The streets were so covered in a layer of ice and snow, and packed, though it hadn't snowed in two days," Durham said. Wichita's deputy public works director, Joe Pajor, was just as frustrated. "We didn't have full salt on hand. We relied heavily on 100 percent sand treatment," he said. The city has no end of sand at the public works yard, but that won't melt the snow. For that, you need salt. There's stronger stuff, such as magnesium chloride or beet juice, but salt is usually much cheaper. "The salt has been in Hutchinson for 242 million years," Pajor said. "Now our challenge was, last week, getting it 60 miles from Hutchinson to Wichita." 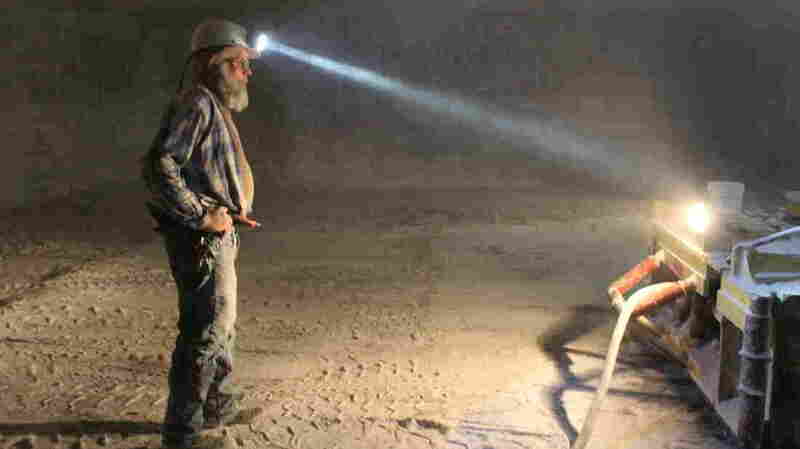 Miners drop 650 feet down to the base of the salt seam, where beams of light from their headlamps cut through white dust. They go after walls of rock salt with explosives, drills and enormous grinders. These miners and machines can claw out about 3,000 tons a day. This winter, though, even that's not enough. "We have been working 24/7 for several months now," said Hutchinson Salt Co. Manager Harold Mayo. This winter's relentless snowstorms have depleted stockpiles and pushed the salt industry to its limit. Mayo said he gets calls from people who found the mine on the Internet, hoping it has salt. He tells them no. Salt miner Lewis Lavy rests for a moment before drilling another wall of rock salt. "Regardless of price, we just don't have it," he said. Every chunk of salt coming off the conveyor belt is already committed and shipped not long after it reaches the surface. Outside the mine, trucks wait to load the product, sitting idle for hours or sometimes even overnight. As a result, logistical bottlenecks drive up shipping prices. The bitter cold has also frozen major rivers and lakes, blocking barge traffic. The price of salt delivered to Chicago, for example, has jumped as much as fivefold. Earlier in the year, a ton of rock salt would cost $50. Now, it can cost $250 or more, according to Tom Breier, who runs the distributor Ice Melt Chicago. Supply is tight, and demand surges every time there's another big storm. 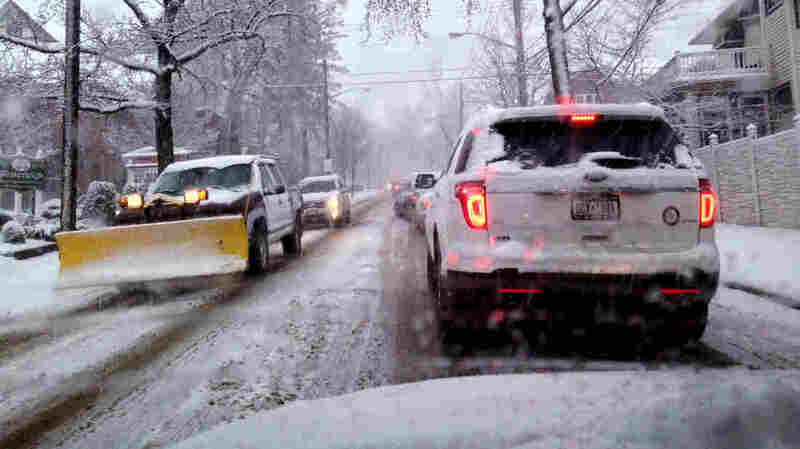 Over in New Jersey, Paterson Public Works Director Chris Coke said he has used up most of his salt and can't treat the city's hilly streets effectively. In the meantime, he's working with the police department to keep people off the roads when conditions are bad. "Our salt supply is extremely low," he said. "Dangerously low, actually." With all this grief, why don't cities just buy more salt in the summer when it's cheap? Because it has to be kept inside, away from runoff, and most local governments don't have room to house enough salt for a crazy winter like this one. Also, salt solidifies and gets tough to handle if it sits around too long. Back in Wichita, at least, the situation may be easing. The city is finally getting some of the salt it ordered two months ago from the mine in Hutchinson. And the forecast there calls for warmer weather — possibly ushering in the new season of potholes.